There is an extremely interesting background image, which we will take a closer look at below. We discovered this photo at a German-speaking Bosch website that presents the news in the field of measurement technology. What can be recognized from the photo? It is obviously a laser distance meter. The model name is missing on the device or has been removed. 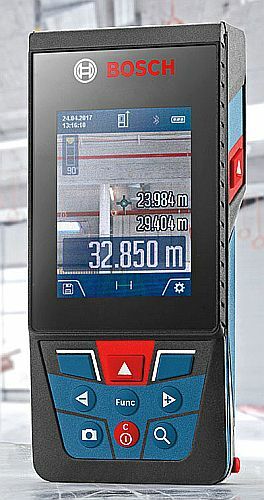 All current Bosch laser distance measurers of the Professional-series carry the model name on the front, why should the pretest device be an exception? The date on the display shows April 24, 2017 and the time. The measuring reference can probably be adjusted because there is an indication with the reference to the trailing edge. Bluetooth is active, so the pretest device should be compatible with Bosch’s Measuring Master App. A battery or charging indicator suggests that an accumulator is integrated. There is an inclinometer that displays 90 degrees. There are function keys with changing meanings which are defined in the display. Shown in the photo is probably “save” and “settings”. These are the facts that can be deduced from the photo. What else can the pretest device do, that cannot be deduced from the photo? What will such a device cost? Is the pretest device real or fake? Is it a prototype for a specific model that will actually be launched? So far the simpler and cheaper Bosch-models differ between the US and the European version whereas the complex distance meters are nearly the same in both markets. When can I buy the “pretest device”? Will this device come to the US-market? Or is it a European version? Why is Bosch putting a photo online that clearly shows a device, that does not yet exist for customers and that has not yet been announced? In the days since this pretest device post went online, I was not idle. At the moment I’m looking at the GTC 400 C Professional thermal imaging camera, which Bosch is just starting to ship. This camera comes in an L-Boxx with some documentation. Among other things, a flyer for apps and interfaces is included. This flyer also shows the new laser rangefinder. There are even two different pictures: one is identical to the one shown above. The other shows the laser distance measurer with 4 measured distances and dark blue display, ie without camera image. Next to the photo the text explains: “GLM 120 C available from Q2 / 2018“. This solves the mystery of the pretest device and the tension on the new laser distance meter has increased even further. At least the range of 120 m can be derived from the model name. With the camera function, such a distance seems possible. With the Leica Disto E 7500i, which offers a camera image like its predecessor (Disto D5), I was able to measure more than 199 m.
I am curious what the GLM 120 C Professional will offer beyond the above. 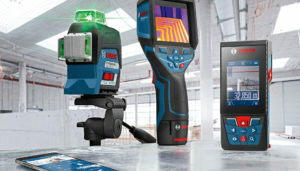 As this story gets a new episode the new laser distance meter from Bosch that uses a viewfinder is available in the U.S. The key features are a 5-megapixel, 8X zoom camera, a scratch-proof screen that makes it easy to find the laser target at up to 400 ft even in bright conditions. The big color display is easy to read and offers clear resolution in dark areas. The BLAZE GLM400CL can take photos and comes with storage for up to 200 images and with memory for 50 measurements. It uses a lithium-ion battery. There is a simpler version available which is called Bosch BLAZE GLM400C. It comes without storage for photos and is powered by three AA-batteries. So far we found no differnces beween our GLM 120 C Professional and the specification of the Blaze GLM 400 CL, except for the printing: Blaze on the side of the measuring tool. Soon we will add our Bosch Blaze GLM400CL review!